Irish Rail is advising customers that bus transfers will be in operation. 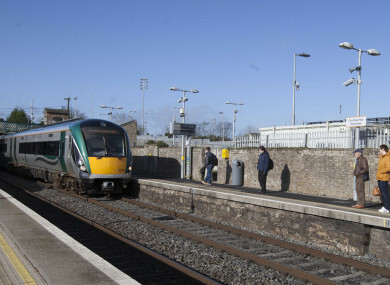 PART OF THE rail line from Limerick to Galway will be closed until further notice. Irish Rail is advising customers that bus transfers will be in operation between Limerick and Ennis from tomorrow. The transfers are due to flooding at Ballycar, an area which has seen a number of significant flood events in recent years, and the bus transfers are expected to continue for a number of weeks. This flooding has led to temporary closures of the railway line for extended periods of up to 20 weeks at a time, although this closure is not expected to be as prolonged. Flood waters rose to a maximum height of 1.60m above the railway track during some flood events, despite works which raised the track level in 2003. The flooding has also caused disruption to the water supply to Newmarket on Fergus as well as blocking local roads and restricting access to farming lands. The disruption will see all services between Limerick and Ennis will substituted by bus, except the Sunday 06.50 Limerick to Ennis and 21.40 Ennis to Limerick services, which are cancelled. All services between Limerick and Galway will be substituted by bus between Limerick and Ennis, with a train between Ennis and Galway. Sixmilebridge station will have bus transfers to and from Limerick and Ennis, but to a reduced frequency. Full service details can be found here. Email “Getting the train from Limerick this weekend? There will be bus transfers”. Feedback on “Getting the train from Limerick this weekend? There will be bus transfers”.